"I walked into a store. The ordinariness of what I saw repelled me: people putting onions into baskets, squeezing melons, hoisting gallons of milk, clerks ringing up sales. "How are you today?" "Have a good day now." How could everybody be going about their ordinary business when these were no longer ordinary times? I went to my office and along the way saw the secretaries all at their desks and the students all in their seats and the teachers all at the podiums. Do you not know that he slipped and fell and that we sealed him in a box and covered it with dirt and that he can't get out?" A tiny little company published this book earlier this year and so no surprise if you hadn't heard of it yet. It is the firsthand account of Rosaria Champagne Butterfield, who begins her story in the days when she was a professor at Syracuse University with a full personal life as a lesbian activist. Everything changed when she published an editorial in her local paper and a pastor in her town responded. His letter was so thoughtful and so open that she couldn't put it away, and eventually she called and accepted his invitation to have dinner in his home with his family. What grew from that was a totally unlikely friendship that, eventually, also led to a friendship with Jesus Christ. Dr. Butterfield's journey after that is nothing short of extraordinary. Her entire life is transformed. By the end of the book she is writing as a pastor's wife and a busy homeschooling mother of several adopted and foster children. It's a challenging story for anyone to read, for she is a woman of extremes no matter where you stand on many social and theological issues. I highly recommend it. My brother Eric recommended this book to me to help me understand the 2008 fiscal crisis on Wall Street. Although it wasn't my favorite book I read all year, it was enormously helpful in explaining the crisis in layman's terms. The author Michael Short has written fast-paced nonfiction accounts of real events in the past--notably Liar's Poker and Moneyball--and so he's just the right person to lead you through the drama of Wall Street with all the intrigue and personal stories to keep you engaged. I felt like a much better-informed citizen after reading this book. Oh what a delight! This short, sweet collection of letters can be read in an hour or two. Helen Hanff addresses her first letter in 1949 to a bookshop in London to ask for two hard-to-fine volumes. Twenty days later she receives a reply from someone at the bookshop known only as FPD, who lets her know her books are on their way. Over the next 20 years Helene and FPD (who eventually becomes Frank Doel) develop a warm and robust correspondence that grows to include letters to many members of the bookshop on Charing Cross Road as well as Christmas packages with hams and fresh eggs. The book moved me to tears. At the end of the book Helene tells a friend visiting London, "If you happen to pass by 84, Charing Cross Road, kiss it for me. I owe it so much." After reading this book, I should like to give it a kiss myself! I felt my love of literature, letter writing, and lyrical prose refreshed after reading this book. And now my favorite book I read all year: Jon Krakauer's gripping account of the 1996 Mt. Everest climbing disaster. I share the world's healthy respect and awe of the mountain but, like most, I had no idea what requirements are in place to climb the mountain (the answer = money more than skill, believe it or not) or how the climb is paced and organized. I also had no idea that May of each year is a very busy time on Mt. Everest or that the people climbing in May 1996 were especially fascinating, heart-warming, and sometimes profoundly aggravating characters. As I finished the book I literally could not move from my chair. I was sitting outside in the spring and shaking from the cold (or was it because of the book? ); Elliott went and got me a blanket because I couldn't bear to stop reading for one moment. 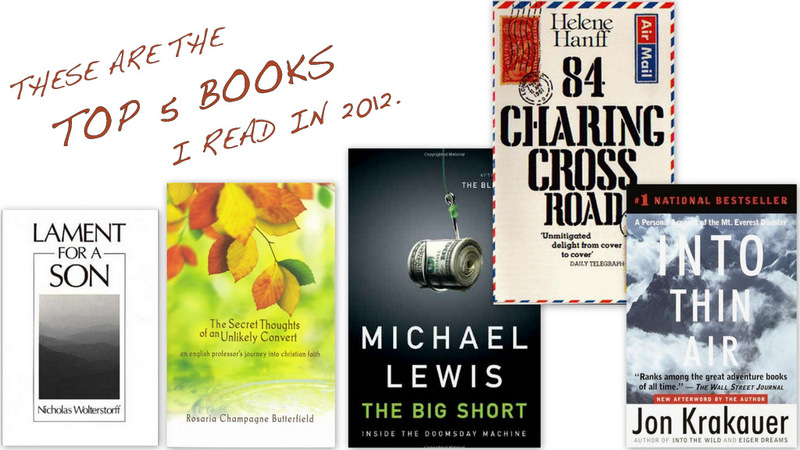 I loved it so much that it was my November/December choice for my book club, Read the Change. And now I've said enough... go read it! My mom and I read Into Thin Air in high school as part of a book club. So good! I think there's a documentary on it, that she's watched also. Laura, I'll email you in case you don't read this, but YOU were the one who recommended this to me and got me to read it! I never told you that I followed your suggestion, but at least now you know that I loved the book. Such a treasure! thanks for sharing, Becca! I'll have to add these to my 2013 list! These all sound so interesting! Thanks for the recommendations! isn't it amazing how a book can impact someone? Thanks for the book recommendations I need them! Loved loved loved Into Thin Air. So good. thanks for the reading suggestions, i need to make it a goal of mine to read more through 2013, i should start with any of these books! Oooh more books to add to my list, thanks! I read Into Thin Air about five years ago, and it is still one of my favorites. What a gripping, fascinating story that was! good to know! We got an iPad (since packing all of my books was out of the question) and I need some good recommendations!